Opening a school to teach Equine Therapy has been a dream of mine since I began this career path. There are so many therapy techniques and methodologies that complement each other that by combining them we are able to offer the horse an all encompassing treatment program. Equine Therapy does NOT replace vetinary medicine but provides a complimentary method of care. Amy has worked as an Equine Performance Therapist for over 9 years. She has worked on horses from all walks of life from family pets to Grand Prix, Olympians, and Professional Reiners and Barrel Racers. She has clients all over the Lower Mainland, Pemberton, Vancouver Island and the USA. In addition to working with and treating horses she has also run a successful series of clinics helping horse owners to help their horse, a stepping stone to opening Kheiron College. When I contacted Amy I was beginning to lose hope of having Roxy sound and happy again. She was irritable and cranky and unsound for riding. Amy came and suggested some natural medicine and stretches that I could do with Roxy in addition to adjusting, my less than accomodating mare. I know my Roxy must have been the worst patient ever! She was trying to kick and bite! Amy has a way with horses that is gentle, but also gets results! I noticed improvement with Roxy within days! When Amy returned the following week it was amazing the progress Roxy had shown. Within 4-weeks I was riding my Roxy again and her temperament had improved 100%! I know Roxy will be okay now thanks to Amy! Amy, with her Masters in Business Management and over 15 years of experience in both the corporate and equine fields will be the Senior Educational Administrator as well as one of the lead instructors. She has diplomas in Homeopathy and Naturopathy and graduated with honors from the Prairie Winds School of Equine Therapy in Colorado. She has recently been awarded a Diploma with Distinction in Instructor Skills to take on the role as SEA for the school. Christa Miremadi of Silver Star Stables and Horsemanship from the Heart has been working with and around horses since 1984. She has had experience in both English and Western competitive riding as well as guiding trail rides, overnight out-tripping, ranch work, facility management and much more... For the last 12 years, Christa has been a partner in the family business, facility manager and co- herdsperson for more than 30 horses. Christa holds a Level 4 CHA certification in Equine Facility Management as well as being a Certified Instructor in both Western and English Horsemanship. Though she still teaches riding lessons and continues to guide trail rides, training people and horses is her main focus and passion. Through her deep understanding of equine behaviour and psychology, gained over more than 25 years with horses, Christa develops safe, consistent and reliable boundaries, earning the respect and leadership needed to influence the horses she works with. This helps them to find the quiet, calm and peaceful state of mind that will allow them to grow, learn and gain confidence. Christa has also turned to martial arts as another form of self improvement as well as to help her in dealing with unwanted horse behaviours. With well over a decade of experience caring for a growing herd of horses, Pinto has developed a sense of timing, patience and feel for horses that is second to almost none. He considers himself a student of the horse. His timing is completely based on the individual horse that he’s working with and changes for each horse. This has led to a passion for helping horses to understand better what their owners are expecting of them. 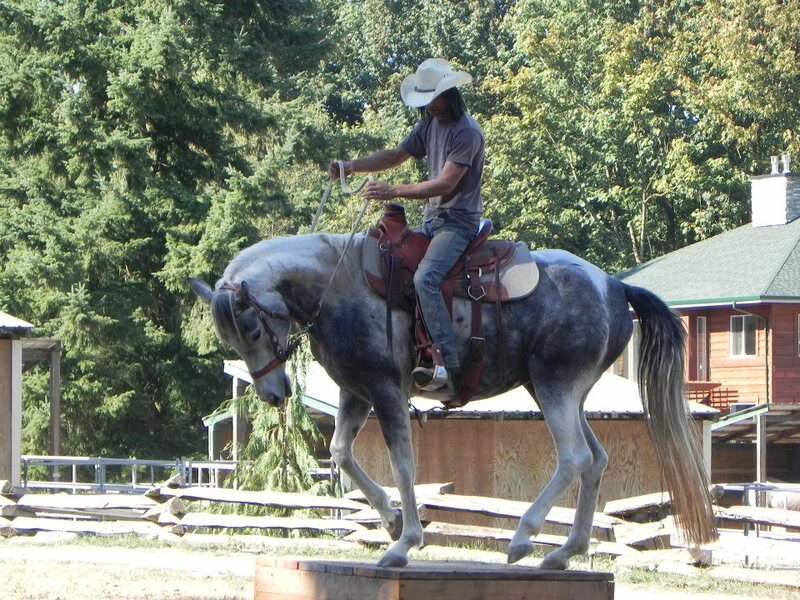 Pinto has helped his wife Christa with many of Rock’n Star Ranch’s own horses, as well as taking on others’ horses who have developed unwanted habits and behaviours. He has greatly improved the willingness and attitude of the horses he’s worked with, as well as furthering the owner’s understanding of the origin of the behaviour and how to help their horse to avoid repeating these unwanted actions. Carol Dymond of Silver Star Stables is another of our instructors. With over 15 years experience as a self-employed music instructor (holding a Bachelor of Music degree), dealing with up to 30 students per year and also 2 years experience managing the lesson program at Silver Star Stables as well as the client invoicing and staff payroll, Carol already has the experience needed to fulfil the requirements of this position. Carol also holds 3 certifications from the Certified Horsemanship Association (CHA) - Western Horsemanship Instructor level 2, English Horsemanship Instructor level 2 and Trail Instructor/Guide level 1. Lucy is our Onsite Administrator. Always a horse addict, she took riding lessons as a teen and then didn’t get back into horses till her first child was born. When her second was born, Lucy was again missing horse time so became involved with a rescue. During 10 years at Circle F, Lucy held the positions of Vice President, Horse team leader and Health Team Leader which is where Lucy met Amy and saw the work that she does. 2 years ago Lucy got her first horse and has now joined a drill team where they have performed at various shows. Lucy is hoping for many more adventures with her!. Lucy has completed several equine first aid courses, a professional mane and tail braiding course as well as several first aid seminars. Lucy has 16 years administrative experience and is delighted to be part of the college!